Most VEX EDR sensors are compatible for use in the FIRST Tech Challenge! Use these to aid in autonomous mode and other programmed functions. Note: To be compatible with FIRST Tech Challenge, VEX EDR sensors will need their connectors converted from male to female, or by using a female to female adapter. The LIS344ALH capacitive micromachined accelerometer features signal conditioning, a 1-pole low pass filter, temperature compensation and g Select which allows for the selection among 2 sensitivities. Zero-g offset full scale span and filter cut-off are factory set and require no external devices. The sensor will measure acceleration in both directions along each of the 3 axis. Acceleration along the X or Y axis in the direction of the silkscreened arrows will produce a larger reading, while acceleration in the opposite direction will produce a smaller reading. 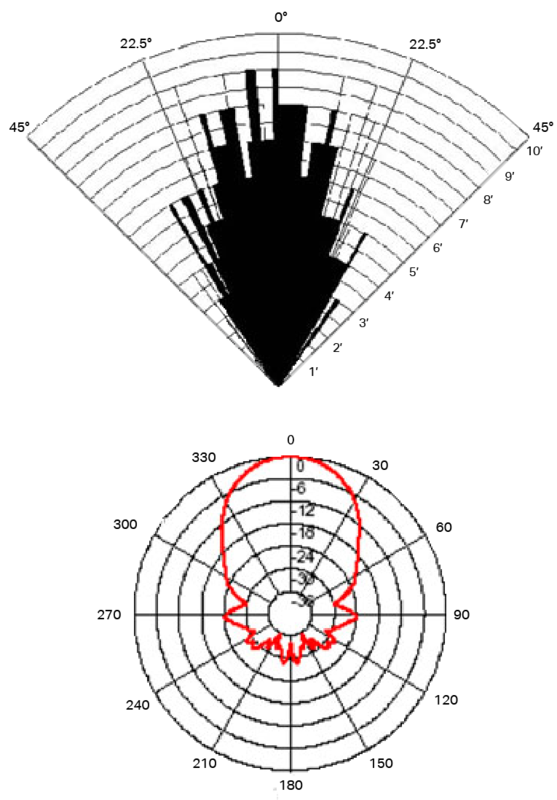 For the Z axis, upward acceleration (in the direction of the board's face) produces larger values, and downward acceleration (toward the board's back) produces lower values. Gravity is indistinguishable from upward acceleration, so the sensor will detect a constant 1.0G while at rest. If the board is mounted horizontally, gravity will effect only the Z axis. If the sensor is tilted away from the horizontal, the gravity reading on the Z axis will diminish, and the readings on the other axis will change depending on which way you are tilting it. 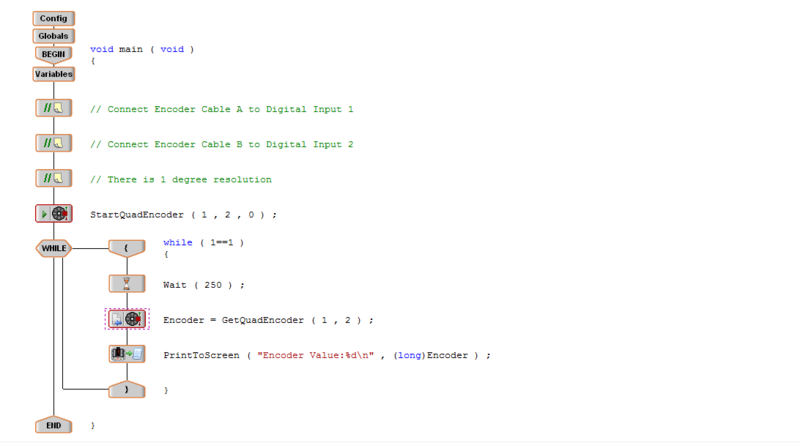 Each channel used must be connected to an analog input on the VEX microcontroller using a standard servo extension cable. You don't have to hook up all the channels; you only need to connect the ones required for your application. The white (signal) wire of each extension cable goes near the 'X', 'Y', or 'Z' silkscreened on the board. The black (ground) wires go at the other end, adjacent to the 'B' silkscreened on the board. The center wire is for +5 volts. Also, the mounting holes are electrically isolated from the circuit. The accelerometer has two sensitivity ranges, selected by a jumper. Pin 1 of the Jumper (the pin closest to the "Y" marking) connects directly to the LIS344ALH with a 1K pulldown resistor. Pin 2 of the Jumper connects to +3.3 volts. The easy way to remember the jumper settings is to add the values of the installed jumper; The larger the sum, the larger the range. You can control the Sensitivity Ranges remotely by connecting your control signal to pin 1 of the Jumpers. The Max Input voltage for the Jumpers is +3.3 Volts. For more details, please refer to the data sheet on the STMicroelectronics LIS344ALH chip. 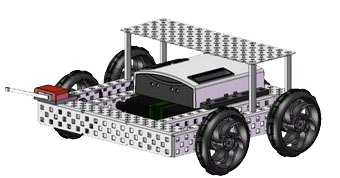 The bumper switch can allow a robot to navigate autonomously by avoiding hard collisions, such as hitting a wall. For example, a robot can be programmed to briefly freeze when the bumper switch is activated, and then reorient itself so that it is no longer driving towards the obstacle. 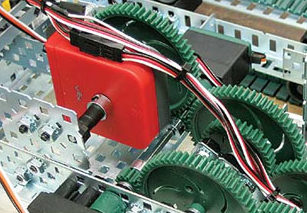 Figure 2 shows where the bumper switch would be placed to be the first part of the robot to make contact with a wall or an obstacle. Benefits: Limit switches expand the functionality of robots by allowing controlled motion in moving components (e.g., gripper arm). They also allow the robot to better detect its surroundings, by detecting collisions with external objects. The limit switch is used to determine the proximity of equipment (the Applications section illustrates a few examples). The limit switch can output only two signals: ON and OFF. It outputs a digital ON signal when the lever arm is depressed and a digital signal OFF when the lever arm is not depressed (see Figure 2 below). External forces, such as collisions, produce a digital ON signal, which remains ON until the lever arm is released. Limit switches provide the capability to limit action in programmed behaviors. For example, a robot can be programmed to stop forward motion if the switch is triggered ON. 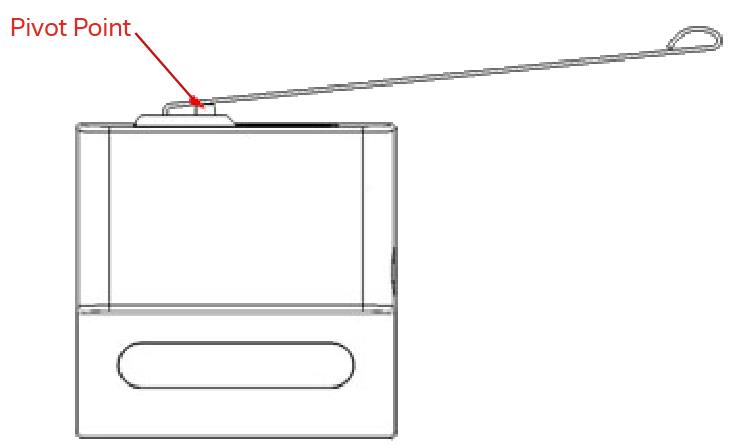 Figure 3 below shows a limit switch placed on the front of Squarebot. 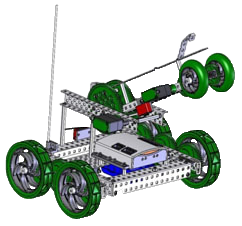 If this Squarebot were to run into a wall or another obstacle, the limit switch would be triggered ON and the robot would stop, as programmed. Similarly, triggering the limit switch can tell the microcontroller to stop rotating robot components, such as arms. 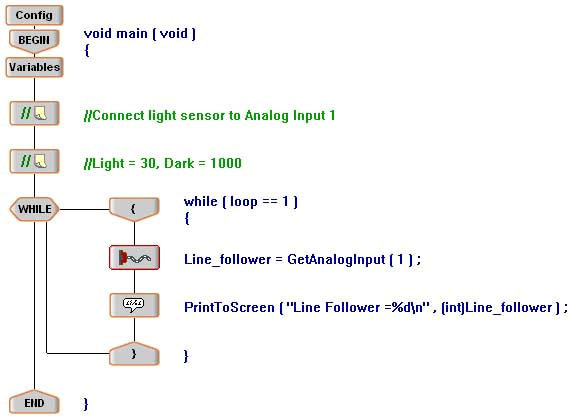 A Programming Kit is needed to implement this (see Programming Resources for sample codes). 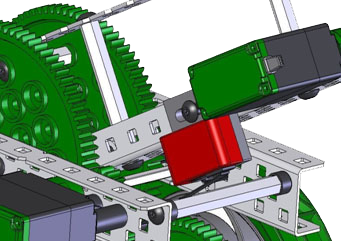 Figure 5 shows a close-up of the limit switch placement on Protobot. As the limit switch runs into the horizontal bar below the lever arm, the limit switch is triggered ON and the microcontroller stops the arm from rotating. The limit switch will be either in the ON or OFF state. The torque required to change from OFF to ON (i.e., depress the lever arm) for an unmodified limit switch is approximately 0.005N-m, which is equivalent to applying approximately 0.03lb 2in away from the lever arm pivot point. Figure 6 below shows the location of the pivot point. If the limit switch is modified this torque will vary. If necessary the specific torque or amount of force required to trigger the limit switch at a specific distance can be calculated using basic torque equations. The Optical Shaft encoder is used to measure both relative position of and rotational distance traveled by a shaft. It works by shining light onto the edge of a disk outfitted with evenly spaced slits around the circumference. As the disk spins, light passes through the slits and is blocked by the opaque spaces between the slits. 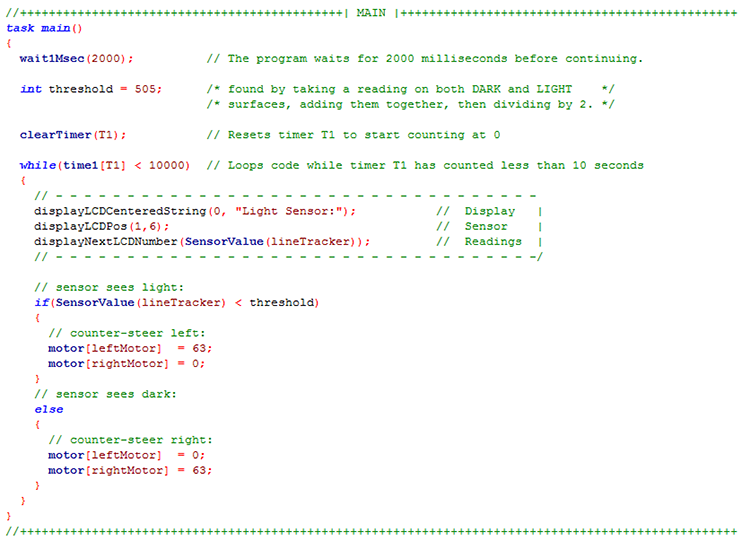 The encoder then detects how many slits have had light shine through, and in which direction the disk is spinning. Figure 1. Optical Shaft Encoder disk. The Optical Shaft Encoder can be used to improve a robot in various ways. The encoder can measure rotational distance traveled and speed, which can be used to monitor, for example, the angular position of a robot gripper arm or the speed of a robot. 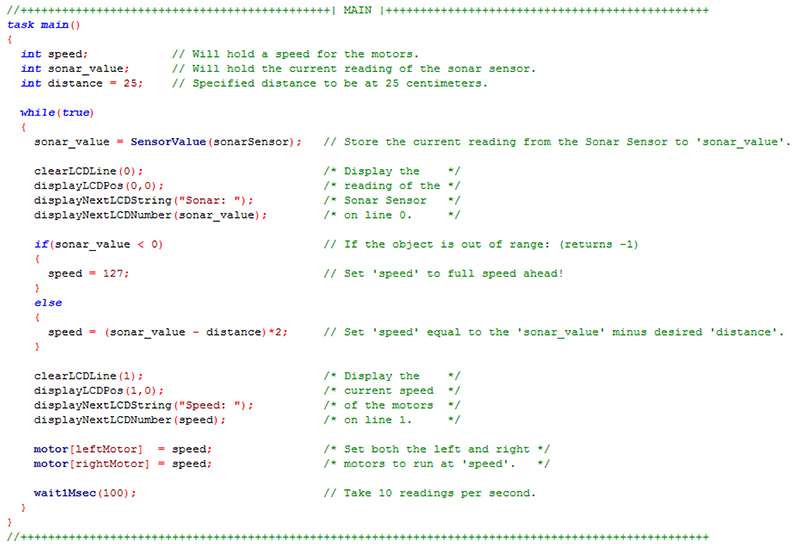 Knowing these parameters can greatly assist you with performing autonomous tasks with your robot. The Optical Shaft Encoder can be used to track distance traveled, direction of motion, or position of any rotary component, such as a gripper arm. The encoder can also be used to detect movement, which could facilitate richer interaction between the robot and its environment (e.g., human-robot interaction). If a human moves a robot arm that is attached to an encoder (e.g., during a handshake), the robot detects the arm movement and the direction(s) and distance(s) traveled, helping the robot classify the interaction as a handshake. While the diameter of the disk in the encoder does not really matter, the diameter of the wheel or gear whose shaft passes through the encoder does! The circumference of the wheel is equal to its diameter multiplied by pi (approx. 3.14). Multiplying the distance traveled which when multiplied by the number of revolutions gives of the distance traveled. The optical shaft encoder can detect up to 1,700 pulses per second, which corresponds to 18.9 revolutions per second and 1,133 rpm (revolutions per minute). Faster revolutions will therefore not be interpreted exactly, potentially resulting in erroneous positional data being passed to the microcontroller. A potentiometer (or "pot") is an electrical device used to measure angular position. The user can therefore adjust the degree to which the potentiometer opposes electric current through it, simply by turning a shaft that is attached to the center of the potentiometer. As the resistance of the potentiometer changes, so does the voltage, which thus causes the potentiometer to act as a variable voltage divider. This varying voltage can be measured by the VEX microcontroller and is directly proportional to the angular position of the shaft connected to the center of the potentiometer. This allows you to obtain an analog measurement of an angular position. The VEX potentiometer is designed with a “D-hole” in the center, which should slide easily over the VEX square shafts. The potentiometer includes two arcs, each ½in from the center hole; these arcs exist to assist with mounting the potentiometer to the robot structure. Figure 1. Potentiometer graphic displaying how to use arcs for mounting. 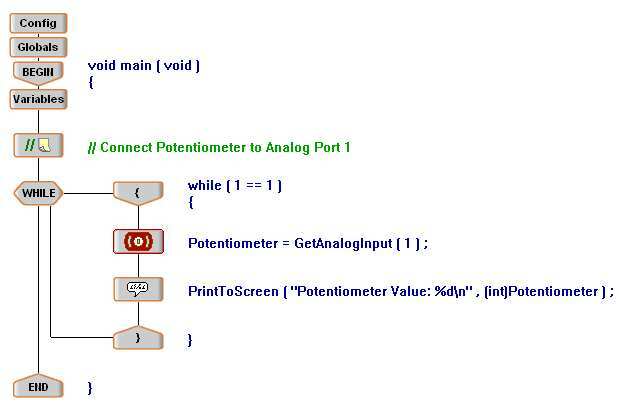 Note: Before you can use the potentiometer, you must reprogram your VEX microcontroller to read the varying voltage of the sensor on the corresponding port you are planning to connect to. Incorporating the VEX potentiometer kit into your project can make it easier for your robot to perform autonomous behaviors. A robot equipped with a potentiometer becomes aware of the position angles and motion of different components, thus making it more aware of its actions. The VEX potentiometer can be used to measure variations in angular position of different robot components. It can be very useful when implementing robot manipulators or shooters. For example, if you are designing a shooting robot, it is possible to estimate the angle at which the robot should shoot a ball in order to get the ball into the goal from a known distance. The mounting arcs allow for up 90º of adjustment to the potentiometer’s position. Since the potentiometer has limited angular travel, it is important to ensure that the shaft that is being measured by the potentiometer does not travel more than 260º (the potentiometer can only move approximately 265º ±5º and can only electrically measure 250º ±20º). The adjustment arcs allow the potentiometer’s range of motion to be repositioned to match the shaft’s range of motion. To measure the motion of something that rotates more than 230º, try gearing down the shaft’s motion such that the gear attached to this “primary” shaft turns a larger gear attached to a “secondary” shaft. This secondary shaft will therefore rotate less distance than the primary shaft. Once the gear sizes are adjusted such that the range of motion of the secondary shaft is within that of the potentiometer, attach the secondary shaft to the potentiometer. This way, you should be able to indirectly measure the rotation of the primary shaft by directly measuring the rotation of the secondary shaft. An ultrasonic range finder sensor enables a robot to detect obstacles in its path by utilizing the propagation of high-frequency sound waves. The sensor emits a 40kHz sound wave, which bounces off a reflective surface and returns to the sensor. Then, using the amount of time it takes for the wave to return to the sensor, the distance to the object can be computed. To increase the sensing range, the sensor can be mounted to a servo to allow it to rotate. Unlike the bumper switch and limit switch that alert you when they have been hit, the ultrasonic range finder sensor can alert you to an obstacle in the path of the robot prior to hitting it. This can allow you time to safely navigate around obstacles. The sensitivity of the sensor depends on the objects’ surfaces that are detected by the emitted sound waves. For example, a reflective surface may produce a different reading than a non-reflective surface. The resolution of the sensor also depends on the sound waves. However, sound waves can reflect or be absorbed and possibly not return with enough power. Sensitivity: Detect a 3cm diameter pole at greater than 2m. The sensor will measure acceleration in both directions along each axis. 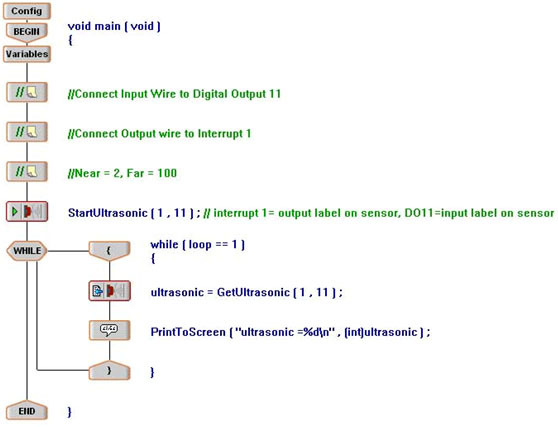 Start signal to the ultrasonic sensor. 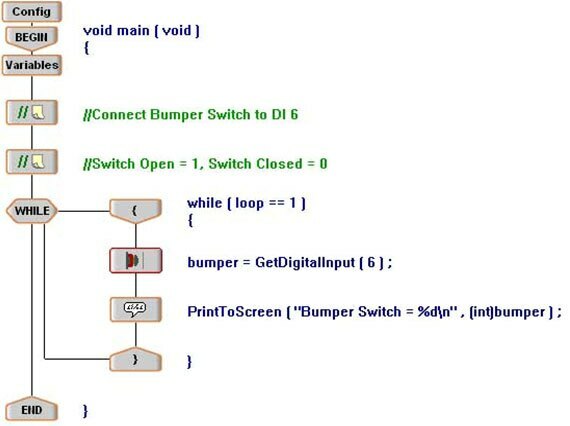 Connect to a interrupt port. Connect to an analog input. 3-Wire Cable Connects to a interrupt port. Echo response from the ultrasonic sensor.